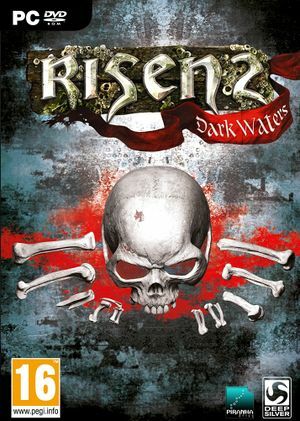 Choice of Standard or Gold Edition. 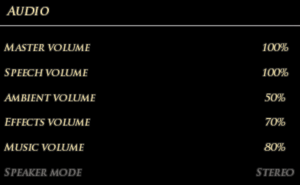 The Gold Edition is a complete edition with all DLC. DLC is sold individually for Steam; for GOG.com the DLC is a combined package (Gold Edition Upgrade). Delete or rename logo_ds.vid, logo_pb.vid and logo_ubi.vid. 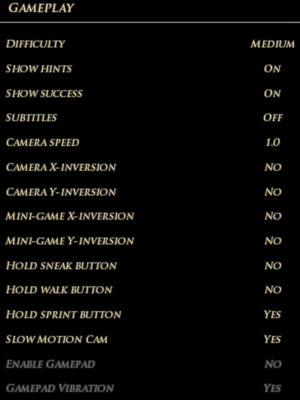 Risen 2 Tune - small utility to manage general game options, like: disabling/enabling AutoSave, Static Camera, SloMo, Tutorial System, Changing resolution, etc. ConfigUser.xml contains settings and achievements. Action_Map_User_1.xam contains primary key bindings. Action_Map_User_2.xam contains secondary key bindings. 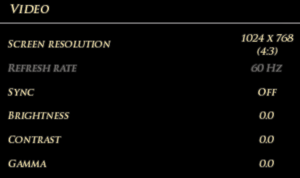 For custom/unlisted resolutions see Widescreen resolution. Use jackfuste's fixes, Flawless Widescreen, or Widescreen Fixer. Use jackfuste's fixes or see the WSGF topic. Add the line "AdapterNumber="0" if not present. To hide system cursor, see Hide system cursor when game is in focus. Supports two bindings per function. XInput controllers only. Disabled by default. Speech, Ambient, Effects and Music. Disabled by default; set in Options, Gameplay. To choose the language for the GOG.com version use Settings.exe in the installation folder. Works with limitations (e.g. shadows must be disabled). Set anti-aliasing AA in catalyst to use application settings and turn on vsync; then in the game, turn off AA and keep vsync. Delete ConfigUser.xml (the next time you restart the game, it will recreate a default configuration file. Re-install the most up-to-date driver. However, while doing so, make sure to select "Custom Installation" and choose to not install the "3D Vision" component. The game may pick the wrong monitor on a multi-monitor setup when a multi-monitor resolution is not used in-game. Change the AdapterNumber line so it reads AdapterNumber="0"
Save your changes and test the result in-game. When running in Windowed mode the game displays both in-game cursor and system cursor. This may be annoying for some people. Below is the script to solve this issue. SetWorkingDir %A_ScriptDir%  ; Ensures a consistent starting directory. OnExit, ShowCursor  ; Ensure the cursor is made visible when the script exits. 3. Reload the script in AHK. ↑ 1.0 1.1 File/folder structure within this directory reflects the path(s) listed for Windows and/or Steam game data (use Wine regedit to access Windows registry paths). Games with Steam Cloud support may store data in ~/.steam/steam/userdata/<user-id>/40390/ in addition to or instead of this directory. The app ID (40390) may differ in some cases. Treat backslashes as forward slashes. See the glossary page for details. 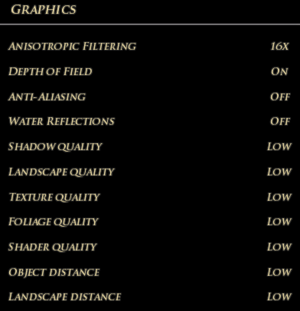 ↑ 3D Vision and other graphical issues.